The DVD-S657 is a stylish slim progressive scan DVD player with outstanding picture and sound quality. 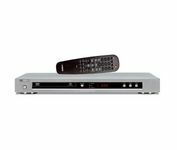 This DVD player features multi-format DVD/CD playback (DVD/DVD-R/DVD-RW/CD/CD-R/CD-RWDivX/MP3/JPEG/WMA ), NTSC/PAL conversion, Dolby Pro Logic II/DTS decoders, sleep function and a variety of connnections including optical and co-axial. good value, video performance is quite good for the price, if not great. used as a CD player it's useable, giving rather mellow, non-forward sound. the older modell, the yamaha dvd-s557 is (sonically) far better, outperforming even 1000 $ CD standalone players (in CD upsampling mode).